Novelist Ellen Meeropol talks about her new work of fiction, Kinship of Clover. Then we talk with filmmaker Dan Natale about his documentary Bad Tidings. It looks at the impact of sea level rise on one vulnerable community in New Jersey. On April 29 2017, thousands will gather in Washington DC and in cities around the country and the world for the People’s Climate March. All ages will gather, no doubt, but those who are young know that they will probably spend most of their lives dealing with the many catastrophes that climate change will bring them: extreme weather, food and water shortages, health impacts from heat and the spread of insect-borne diseases — and the fraying web of life, shredded by mass extinctions of animals and plants. 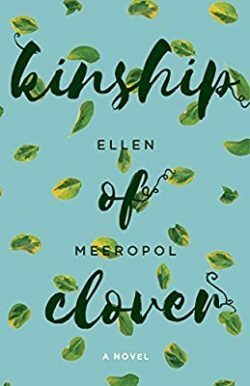 Ellen Meeropol’s new novel Kinship of Clover explores what mass extinction looks like from the point of view of one if its main characters. Jeremy is a botany student at college, whose bouts of anxiety about the disappearance of the species he studies is manifested in his body as a kind of somatic metaphor. He feels extinct plants growing into and out of his skin, leading him and others to question his sanity. But is there any sane reaction to the threat of extinction we face from climate change? What’s crazier: to be obsessed about it or to ignore it? Many find solace in political action. But what kind of activism is best? And how to balance the needs of those near and dear to us with the urge to risk all to take action? These are some of the questions Meeropol asks in Kinship of Clover. She spins her multigenerational tale with a compassionate and sensitive pen, as we follow her characters through their confrontations with mortality, both personal and global. If you live on the eastern seaboard, the vulnerability of our coastlines to sea level rise is obvious every time a big storm blows through and tears out another portion of our beaches. But at least for the next decades and possibly another century or so, most coastal residents have some inland space to retreat to. Not so the community of Sea Bright, New Jersey. Just a slender spit of land, the residents face the grim reality of climate change now and in the near future. It’s likely their homes will be under water within the next 50 years, if not sooner. And the risk to their property of extreme storms like Hurricane Sandy increases their vulnerability. Dan Natale’s documentary film Bad Tidings asks some tough questions. Should residents stay or should they go? Will adaptation work? Or is it foolish to challenge Mother Nature? His film illuminates the tough choices that face all of us as we face the increasing impacts of climate change. Natale majored in environmental policy at Rutgers, where he also earned a certificate in digital filmmaking.